Tim King keeps Sandy Finchett-Maddock cool in the sun. After last year’s successful debut the CA team returned to Countryfile Live at Blenheim Palace, Oxford. The four days (2 to 5 August) were baking hot, but that did not deter the visitors; most of the 120,000 plus visitors wandered past the lawn in the very centre of the show. 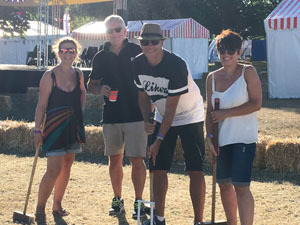 Our counts show that over 900 people picked up a mallet and tried croquet (up from 800 last year); over 85 people left their contact details for Dave Gunn our Development Officer, to steer them towards clubs near their homes- (up from 65 last year) and others made direct contact with a CA volunteer who came from their local club. 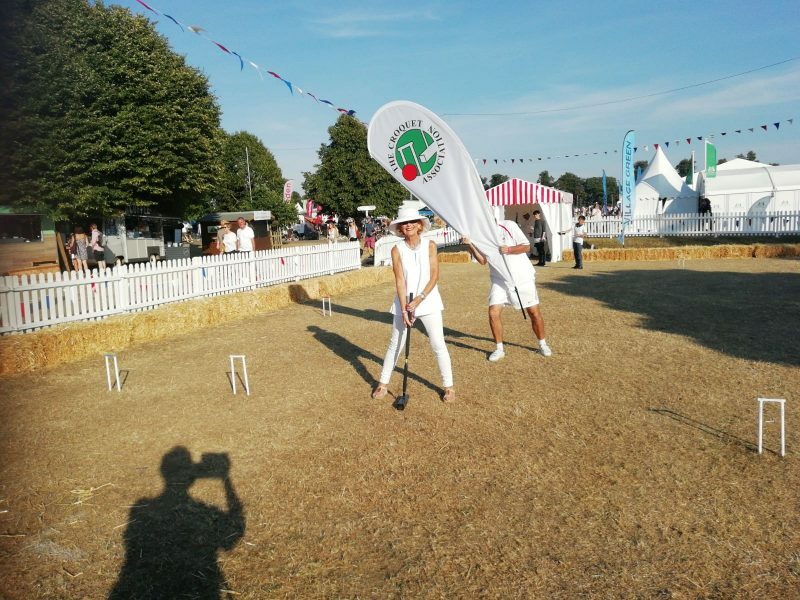 We don’t think that we were on television this year, but Carol Kirkwood gave croquet a go and both she and Anita Rani gave a plug for croquet during the Q & A sessions in the Big Barn. The volunteers also did a great job passing out leaflets and chatting to passers-by: up-dating their knowledge of croquet and dispelling a few myths.It is always difficult to assess impact, but undoubtedly the public profile of croquet was raised and interest stimulated, which we hope will convert into people taking up croquet. This year we trialled four new Sail Flags with the CA emblem on them to catch the attention of passers by and they were very useful. The flags are kept at Cheltenham and if any club wants to borrow them for use at their events, they are most welcome – Surbiton used them at the Solomon this week. Interestingly, Countryfile Live has decided to have two shows next year – one at Blenheim and a second at Castle Howard in Yorkshire so I’ll be talking to our Northern colleagues about any potential interest in the latter. Finally a big “thank you” to all the volunteers who stuck to their tasks in such roasting conditions, to Tony and Pat from Eynsham who did a great job making the lawn out of parkland and managed the setting up and dismantling of the site, to the Eynsham club and Klim Seabright for the loan of equipment and to Frances Colman who recruited the volunteers and managed the admin processes. 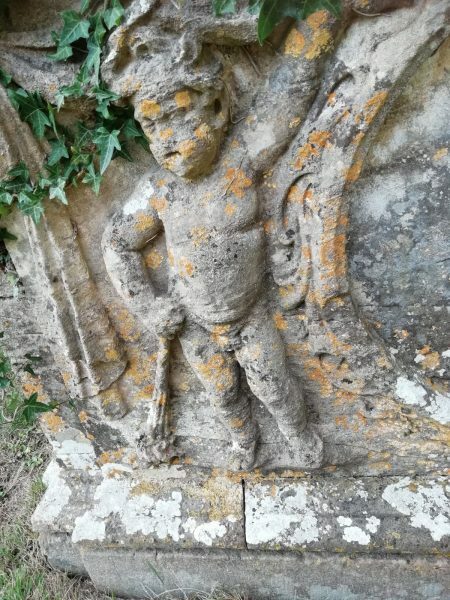 A very slow Croquet player at Chastleton churchyard near where the Laws of Croquet were formulated. 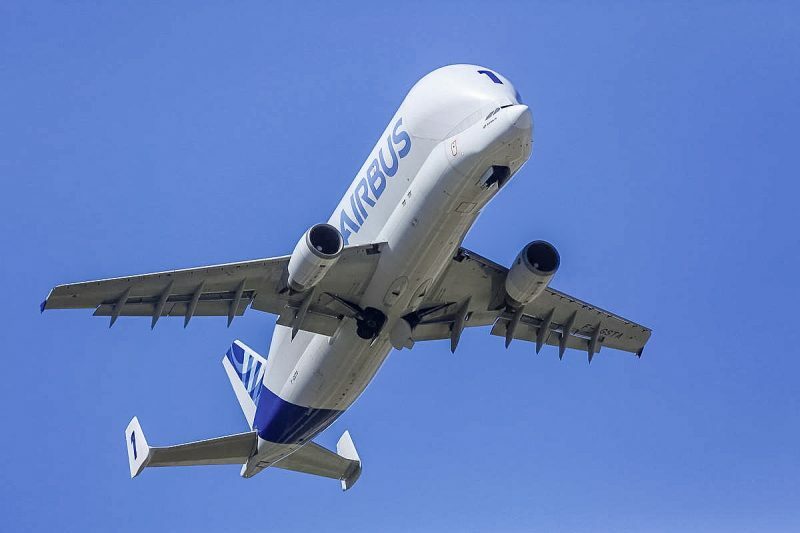 Chester members were enjoying the sunshine with a social last Sunday when we had a fly past by a spectacular plane – an Airbus Beluga. 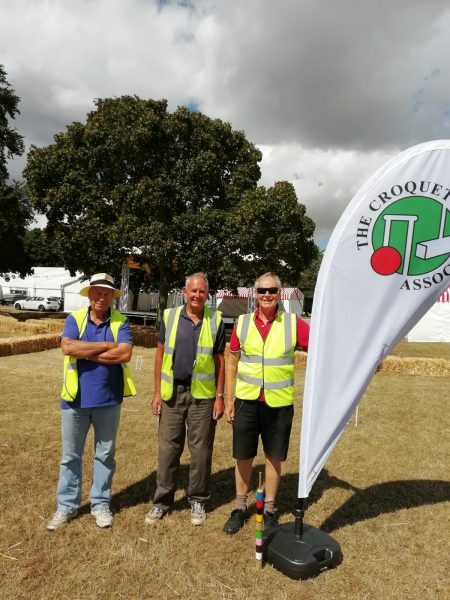 We would like to have thought the pilot and crew were merely flying over to watch croquet in action on National Croquet Day but in reality they were on a routine flight from near-by Broughton. Perhaps I should explain: Airbus makes large commercial planes, notably the A380 plus series. The wings are made in Broughton but the final plane assembly is in Toulouse or Hamburg. Can’t stick the wings in the post so what do you do? The answer is an ingenious modification of an A300 into the Airbus Beluga which can take wings in its “belly”. If you see an unusually large plane fly over your croquet club, you’ll now know what it is. PS: an even bigger Beluga is under development to transport a pair of A350 wings in one go. The wings of the A380 which are too large for even the Beluga XL have to go by sea. 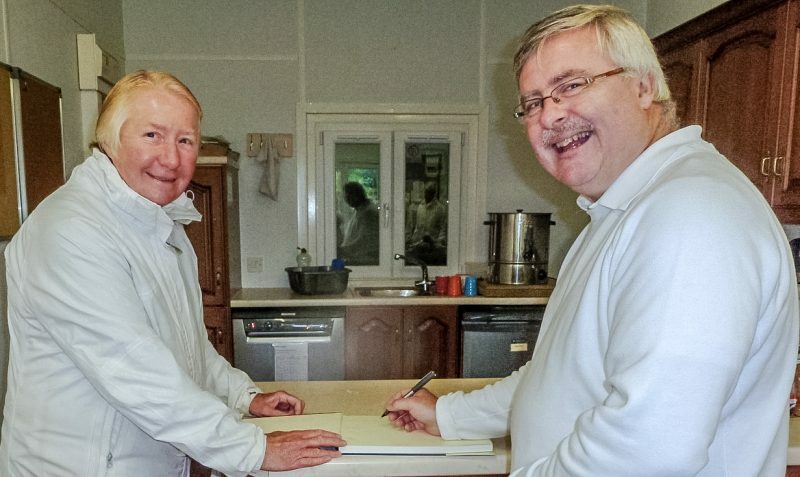 John Dawson, Secretary, Chester Croquet Club.